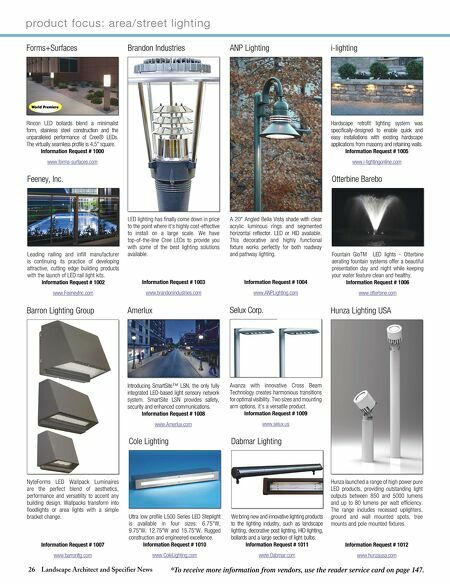 26 Landscape Architect and Specifier News product focus: area/street lighting *To receive more information from vendors, use the reader service card on page 147. LED lighting has finally come down in price to the point where it's highly cost-effective to install on a large scale. We have top-of-the-line Cree LEDs to provide you with some of the best lighting solutions available. Information Request # 1003 www.brandonindustries.com Brandon Industries NyteForms LED Wallpack Luminaires are the perfect blend of aesthetics, performance and versatility to accent any building design. Wallpacks transform into floodlights or area lights with a simple bracket change. Information Request # 1007 www.barronltg.com Barron Lighting Group Hunza launched a range of high power pure LED products, providing outstanding light outputs between 850 and 5000 lumens and up to 80 lumens per watt efficiency. The range includes recessed uplighters, ground and wall mounted spots, tree mounts and pole mounted fixtures. Information Request # 1012 www.hunzausa.com Hunza Lighting USA A 20" Angled Bella Vista shade with clear acrylic luminous rings and segmented horizontal reflector. LED or HID available. 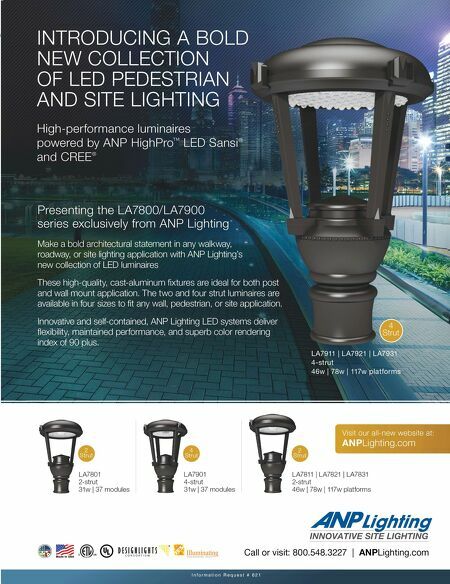 This decorative and highly functional fixture works perfectly for both roadway and pathway lighting. Information Request # 1004 www.ANPLighting.com ANP Lighting Leading railing and infill manufacturer is continuing its practice of developing attractive, cutting edge building products with the launch of LED rail light kits. Information Request # 1002 www.FeeneyInc.com Feeney, Inc. Fountain GloTM LED lights - Otterbine aerating fountain systems offer a beautiful presentation day and night while keeping your water feature clean and healthy. Information Request # 1006 www.otterbine.com Otterbine Barebo Rincon LED bollards blend a minimalist form, stainless steel construction and the unparalleled performance of Cree® LEDs. The virtually seamless profile is 4.5" square. Information Request # 1000 www.forms-surfaces.com Forms+Surfaces Hardscape retrofit lighting system was specifically-designed to enable quick and easy installations with existing hardscape applications from masonry and retaining walls. Information Request # 1005 www.i-lightingonline.com i-lighting World Premiere Introducing SmartSite™ LSN, the only fully integrated LED-based light sensory network system. SmartSite LSN provides safety, security and enhanced communications. Information Request # 1008 www.Amerlux.com Amerlux Ultra low profile L500 Series LED Steplight is available in four sizes: 6.75"W, 9.75"W, 12.75"W and 15.75"W. Rugged construction and engineered excellence. Information Request # 1010 www.ColeLighting.com Cole Lighting We bring new and innovative lighting products to the lighting industry, such as landscape lighting, decorative post lighting, HID lighting, bollards and a large section of light bulbs. Information Request # 1011 www.Dabmar.com Dabmar Lighting Avanza with innovative Cross Beam Technology creates harmonious transitions for optimal visibility. Two sizes and mounting arm options, it's a versatile product. Information Request # 1009 www.selux.us Selux Corp.